Did You Have a Birthday Party When You Were a Kid? I’ve been working with a scene about my sixth birthday party, and it occurred to me that such a staple of my childhood is a segue to certain aspects of the culture of the time period. The post feels simplistic to me, but I’ve actually fretted over each detail here more than is probably warranted ;). When I was a really little kid, in the late 50s and early 60s, the years were divided by Christmas. Since my birthday is in July, that event broke up the boring rest of the year known to me as not-Christmas. 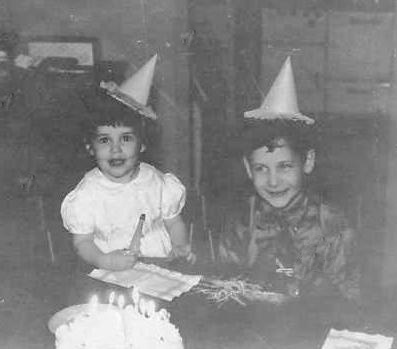 I was an only child until I was well past seven, so my parents didn’t miss an opportunity to give me a birthday party. In Kalamazoo, Michigan, where I grew up, we didn’t have parties in public places or restaurants, but in our own homes. My parents had our parties in the living room, the basement, and out in the backyard, depending on the weather and my mom’s mood. 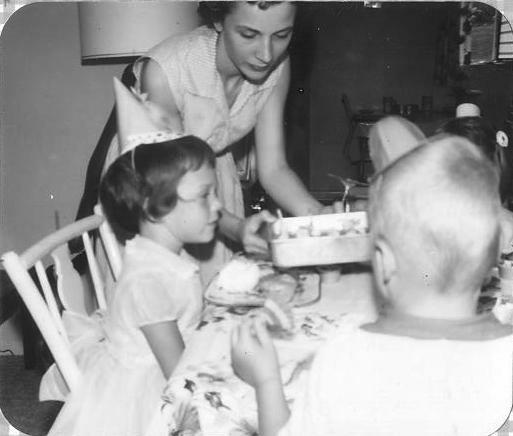 Most of my birthday party guest lists were a combination of local relatives–my maternal grandparents, my mother’s younger sister, and her brother and his family—and the neighborhood kids. I remember the beginning of one party where I let the other kids in the front door, one or two at a time. They were rarely with adults. After all, we were all neighborhood kids and we roamed at will. The girls wore pastel chiffon layered party dresses with full skirts and petticoats. My own dress was pink with darker pink cherries on the chiffon overskirt. 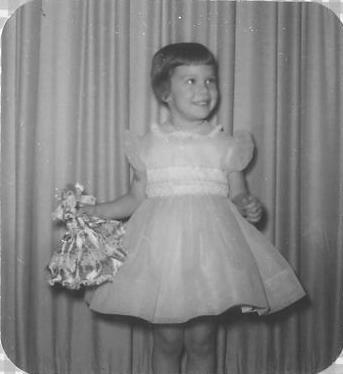 I had fallen in love with the dress when I’d taken it out of the tissue paper Mom had it wrapped in, but now I was the only girl in a print dress. That felt strange, but good, too. A lot of my dress-up dresses were swishy or crackly fancy fabric, like chiffon, and were worn over a net petticoat. Notice the bow sash on the back of the dress in the photo above; that sash was typical of my dresses. When the boys got a little older they wore ties if they were friends. Relatives did not. 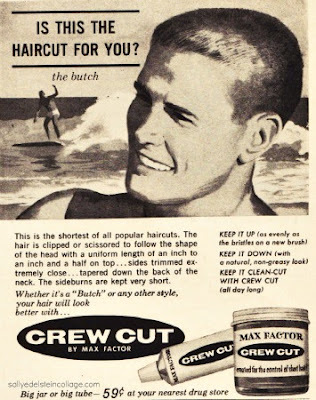 Most of the boys wore their hair in some version of a crew cut, but most had practically shaved heads with a little bang left so you could tell if they were blond or dark-haired. I don’t remember any minority kids ever attending because my neighborhood was all white. Did I mention that over those crew cuts and the girls’ short to medium length hair, we wore silly party hats? See first photo above :). Mom served a birthday cake, which she had made herself. Usually it was a layer cake, standard size. 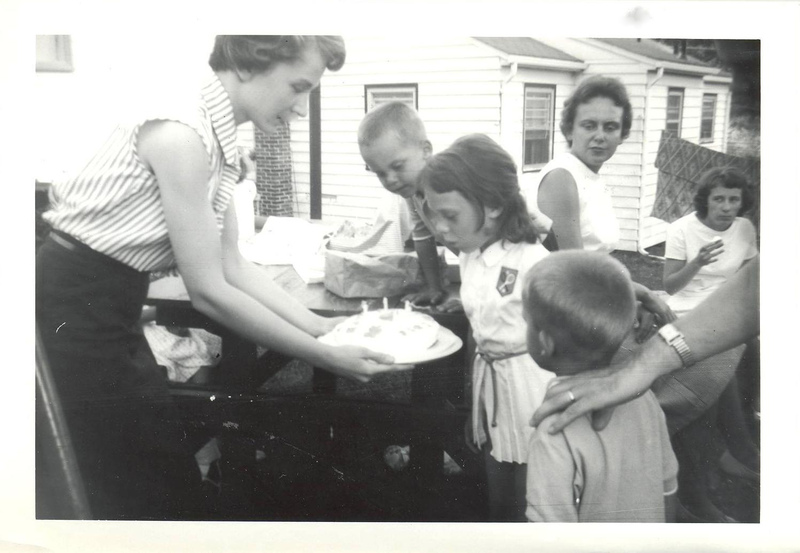 Sometimes she made a sheet cake in a tin cake pan with a sliding lid for church potlucks. If we served a meal, it was simple fare like hot dogs or Sloppy Joes and jello molds. Mom bought little candles from the grocery store for the top, along with pre-made candy decorations and matching candle holders. She served punch, mints, and peanuts. The mints she served us were the small, less expensive mints. 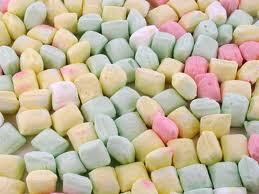 For fancier goings-on, like baby showers, she served the flat sugar mints, which I liked to melt on my tongue. Although my relatives did bring me modest gifts, I don’t remember gift opening being an important activity. 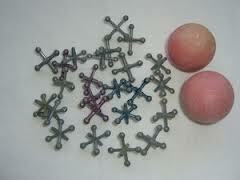 If the other kids brought anything, it would have been a simple toy like jacks or marbles or a jump rope. I had no sense of expectation for gifts or a notion that there was anything in particular that I just had to have. We liked to play games at parties. 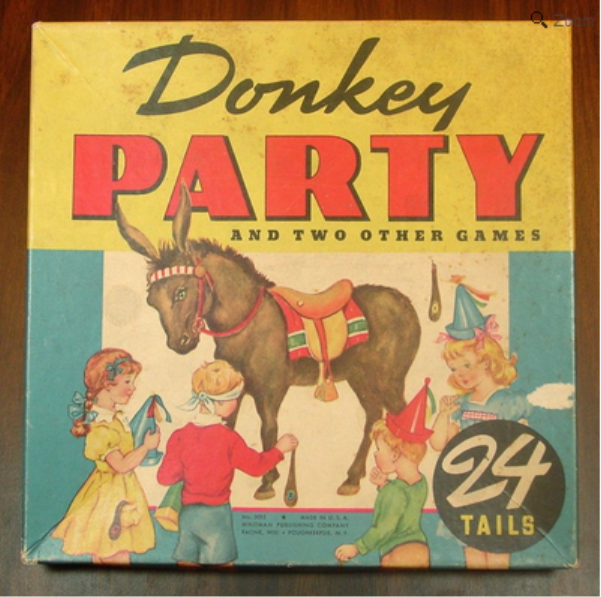 They were typical, well-structured party games. We didn’t have video games or watch movies or go bowling. We played Pin-the-Tail-on-the-Donkey, balloons relays, memory games, and went on scavenger hunts when we were a little older. Dad nailed a big poster of the donkey, sans tail, onto a piece of cork attached to the cement block wall in our basement. Then we took turns being blindfolded with Dad’s bandanna and stumbled a few feet with our paper donkey tail, a thumb tack stuck through it. The person who nailed the donkey’s rear end most accurately won the prize. For balloon relays Dad and I had to blow up a zillion balloons before the kids got to the house. Since I didn’t have very big lungs at that point, that meant that Dad had to generate a lot of air. He’d get giddy and start acting silly from all the puffing into balloons. Then he and I would roll around laughing. The object was that teams tried to beat each other at popping the most balloons. 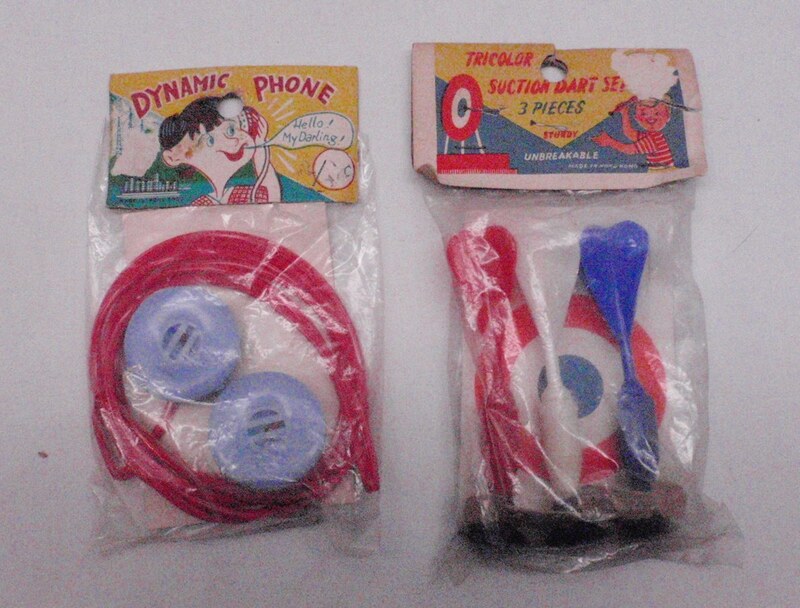 Once us kids were old enough to write, we would play memory games. Mom would line up some small household objects on a tray and we would have to memorize them and then write them down on a piece of paper from memory. Sometimes Mom bought little party books. Then we would play paper and pen games. Does anyone remember those books? Was it one book with several pages for each game–where you tore out the pages and passed them around? Or did each guest get a book? What was important is that every game would net a winner, and the winner would get a prize. The prize was never expensive, but it was something to take home. Each guest was given a paper party favor bag with about ten mints, ten peanuts, a sucker, and one noisemaker. If you won a prize, you got to add that item to your party bag. WRITING PROMPT: Write about a party held in your honor or that you threw for someone else. Start with the planning and preparation. What was most memorable? Then move on to the party itself. During or afterward, did you still think the same elements were important? If there was a change in your thinking did it affect your decision to have a party in the future or what kind of party you want or even the emphasis you placed in the party planning? I’m glad you got some parties, though! I wasn’t very good with the blindfold on either. It felt kind of scary! 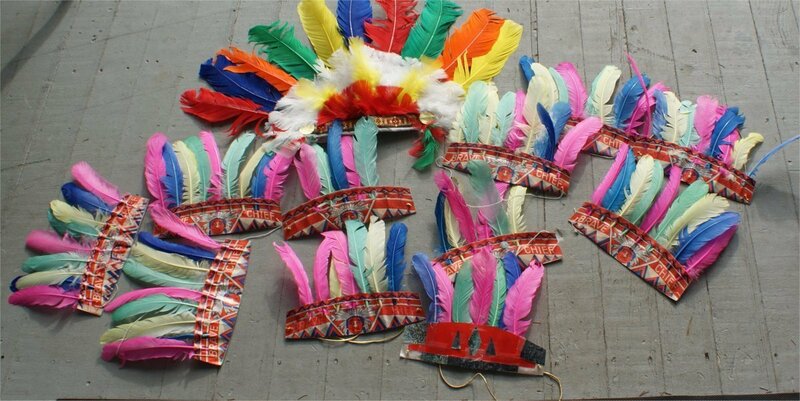 I remember the party hats because our dog used to wear one (while patiently waiting for the pièce de résistance, a cerise icing affair with lanky, rainbow-colored candles). To this day, any room redolent of burning wax brings evanescent memories of those cozy days. Oh my, I’d love to see a pic of your dog in the party hat haha. Beautiful sentiment here, prospero! That’s wonderfully detailed, Luanne, and brings back memories of birthday and other parties. At my July birthday parties, kids showed up in shorts or bathing suits. I loved your fancy dress and all the other pix! Ah, you had some very casual parties, Wilma! I’m glad you liked the photos. how do you like the one of Marshal and his sister ;)? 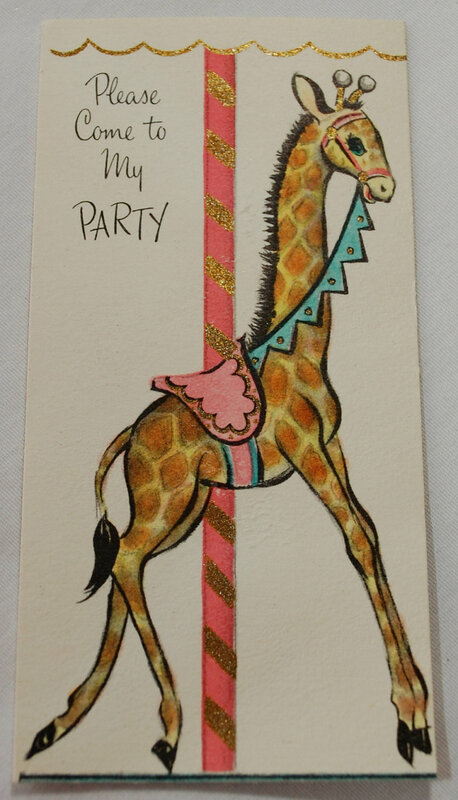 I’m a little jealous of you and your birthday parties! My daughter and I discussed this recently. When I was growing up, my mom didn’t make a big deal out of birthdays. I can only remember having one party and that was in 6th grade. It was a slumber party and was such a disaster that I never had another one, although I enjoyed attending them. Mom did bake a cake every year, which she decorated herself. Most of the time she made my favorite home-cooked meal. I struggled with the birthday party craze when my kids were growing up. I was so out of touch with the process that I didn’t even understand goodie bags. Lots of times I spent all the money I had on the party and had nothing left to give, although I did bake and decorate the cake and cook their favorite meal. Birthday parties seem to have grown into a huge industry over the years. My kids were somewhat deprived, but by today’s standards the parties I gave would be considered lame. I knew I was out of my element when the neighbor’s five year old had a party complete with an inflatable bouncy room. What on earth are the parents going to do for the sweet 16? But then, the parents of my son’s friends in eighth grade hired a limousine for eighth grade graduation. Where do we go from here? I say kids are spoiled when they can’t even name one thing they want for Christmas. When I was growing up I wasn’t given gifts year-round. Anything I wanted, but didn’t need was considered a gift, and I only got those things for my birthday or for Christmas. This sounds like I’m whining, but I promise I’m just fine! Can’t wait to read your book, Luanne! I’m going to share this with my mom. You two are of the same generation, and I’ll bet she’d get a big kick at your great walk down memory lane. So fun! We could have been twins! Remember how those petticoats scratched? Haha, they sure did. Maybe that’s why I’m always looking for comfort in clothing today! Thank you so much for reading.